HYDRANGEAS & ROSES & KMART BACKYARD SWEEPSTAKES! 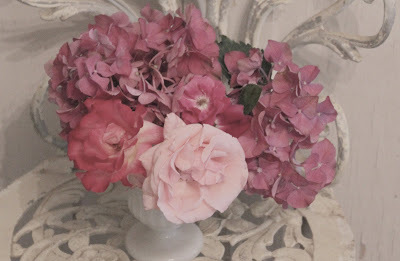 I love pretty pink hydrangeas & gorgeous cottage roses. and are such a perfect pairing with vintage milk glass. Remember the backyard makeover I did with Kmart? Yes, that's THOUSANDS- for 1 lucky winner. design advice from me to help the winner do their makeover on their yard. I am loving hydrangeas this summer. Those are so pretty. I'm going to check into Kmart on FB. Thanks for the tip. 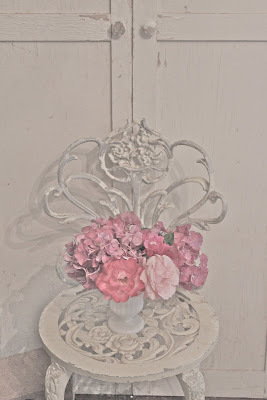 What a lovely vignette you have created on the white iron chair. Your flowers are truly gorgeous! Your flower arrangement is incredibly sweet! I love that chippy little chair, too. Thanks for the holler about the giveaway! That sweet, chippy iron chair makes the perfect plant stand for your lovely flowers. I adore that fabby iron chair, Courtney. The milkglass and flowers look sensational on it. I also love it in the bathroom with the galvanized bucket and pink washcloths. So pretty. And your last post with that lovely burlap table was to die for. Worth all of your hard work sewing, sneezing and watery eyes:)) It looks sensational and I am loving it with those bistro chairs! This is a charming way to display your beautiful bouquet! Just lovely! Perfect little vignette....looks like the cover of a magazine!!! How beautiful. 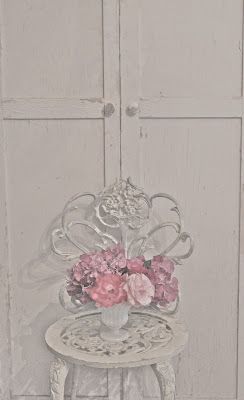 I have always loved Hydrangeas Courtney!! I have a New, very fashionable Giveaway from the Shabby Apple on my site! Come and enter! P.S. If I win I'm thinking you would have to actually come to see my backyard in person to give me the proper design advice, don't you think? wink, wink! Such a pretty picture of the chair! Simply gorgeous! A joy to view! I love that little chair, how pretty. The giveaway sounds fantastic. I wish I could send them a picture of my backyard, it could really use a makeover! Thank you for the great chance at the giveaway. Love the chair...especially the back of it! Beautiful shots Courtney. 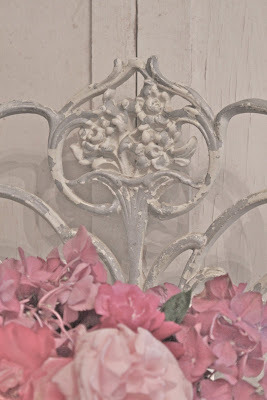 I love the ornamental chair, and the flowers are gorgeous. Ohhh! Thanks for the KMart tip, Court! I'm heading over there right now! Your photos are (as usual) so very beautiful. That sweet chair is the perfect backdrop for that bouquet! :) Hugs to you! Love hydrangeas! They grown in abundance in Pennsylvania. I took a trip up there last week. Courtney if you've never been there you would love all the homes. As for hydrangeas in Pa, it seems people like blue and purplish ones. *scratches head Do they not come in a variety of colors there? Hmm. Not long ago I found a tutorial on drying them; wish I could remember where it was at. If I do, I'll let you know.